Raise your hand if you have a mobile phone? And now raise your hand if you are reading this blog post on your mobile device? Heh! That's what I thought! It is reported that 34% of the data used is on owner's mobile devices. It has been quite a change in the last few years; since in 2012, this percentage was only 17%. You can also use your mobile device to save money and time at work. It is scary that it takes 10 liters of water to produce one A4 sheet. Using digital forms instead of paper forms might help your company by reducing the spending costs up to €2 on every single paper form. This is another reason for a paperless office. Do you already have a smart device? It is incredible that up to 44% of cell owners are sleeping with their phone next to their bed to make sure they don't miss any calls, text messages, or other updates during the night. Now we see why smart watches are such a hot topic at the moment. I assume that for these people being constantly available and being reached at any time is not a problem. 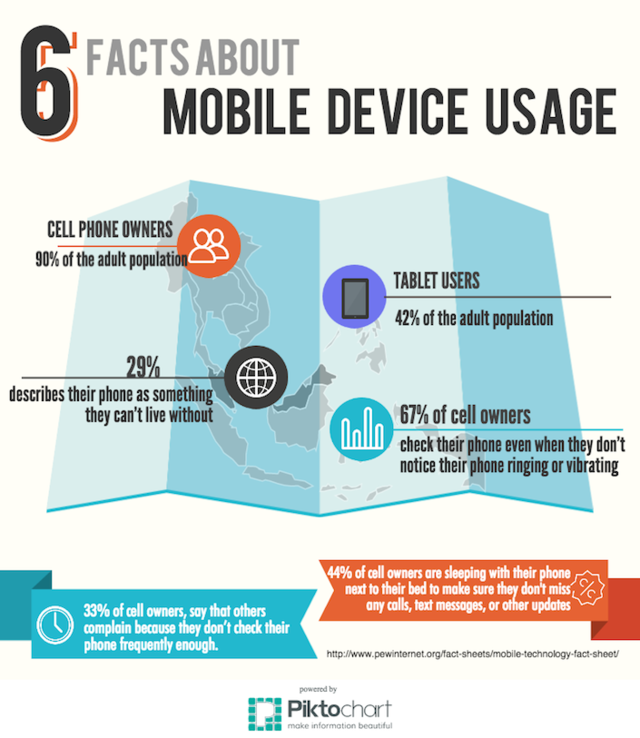 This brings us to the 33% of cell owners who say that people they know have complained because they don’t check their phone on a regular basis. It makes me question what is the normal mobile behavior. People complain if you use it too often and they complain when you don't use it enough. Apparently it is hard to make everyone happy. I have to confess that once my friend, looking for my attention, told me that he wishes he could be an iPhone game so I would spend more time with him. That actually scared me, but then again, who can live without all these awesome mobile apps, right?